New at this garage sale business? No worries. 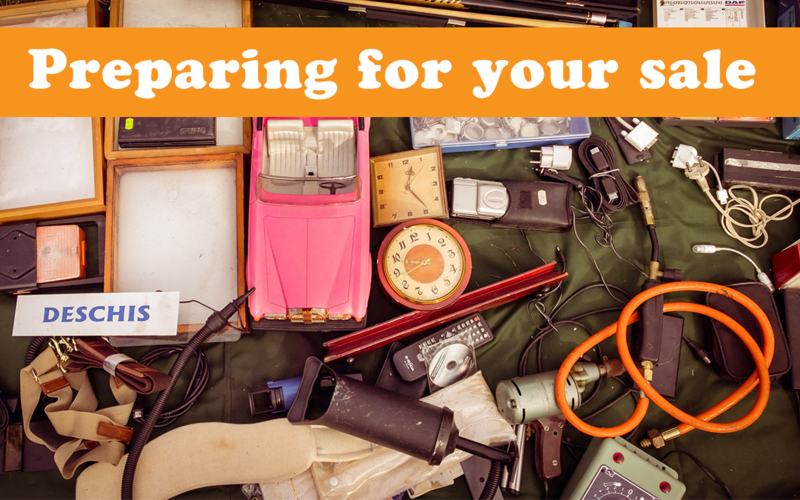 We’ve got you covered with tips and suggestions that will make your sale a success, and help you dominate the citywide garage sales. Do not wait until the night before (or even two/three nights before) to start preparing. You’ll be up all night and you’ll swear to never do another garage sale. Just know it takes two or three times longer than you expect. Start early. The best sales are planned WEEKS in advance. Go through the storage room, closets, the attic, dresser drawers, and the garage to identify items to sell. Begin gathering everything in a central location. This will help the next step—pricing—go much more smoothly. Take time now to wash clothes that you plan to sell. How your clothes smell will matter to buyers, so this extra step can help you earn more money. Do the same with other items that need a good cleaning—wipe down toys, dust books and knick-knacks, etc. Your role as a seller is to be a stellar merchandiser. Merchandising is the art of making your stuff look good—like department store windows. This is your mission, should you choose to accept it. If you do, you’ll make more money. Check with friends, family members, and neighbors to see if they’d like to make it a multi-family sale. You’ll have more workers during the event, and more merchandise to advertise. Plus, the words “MULTI-FAMILY SALE” in a garage sale description tend to bring in more foot traffic. People like to get more bang for their buck, and multi-family sales are a good bet to do that. Now that you have an idea of HOW MUCH you’ll be selling, start thinking about HOW you’ll set it up. Tables are ideal, since shoppers don’t like having to bend over to look at items. How many tables do you have on hand? How many can you borrow, and from whom or where? Some ideas to get more tables: Post on Facebook and ask your local friends if you can borrow a table. Expect to drive and pick it up and bring it back yourself! Post on your neighborhood NextDoor site, asking to borrow tables. I’ve had friends borrow from their church, too. Sheets of plywood and sawhorses will work in a pinch, too. Get creative, but remember the goal is to make your merchandise easy to browse. If you’ve run out of tables, toys can go in bins, so scrounge up as many of those as you can. Some clothing items can go in bins, but only if it’s many of the same thing, like socks. Don’t put clothing that folks will want to sort through in bins. Even if the bins are on a table, it’ll quickly get messy and unorganized. DO NOT lay clothing out on the ground. Certain items you can get away with doing this, but clothes are not one of them. People like to sort through clothing and examine it, and that’s near impossible to do when you’re squatting. Folks will give up and leave instead. Large toys, larger decor, lawn and garden, and the like are good candidates for floor display. Small items, in general, aren’t a good fit for the floor. Find another way to display these items. TheSpruce.com has some of the best garage-sale advice I’ve come across online. In particular, their Planning Checklist is stellar. Some of the items don’t apply to North Liberty (like a garage sale permit or sign permit), but there’s still a lot of genius advice here.